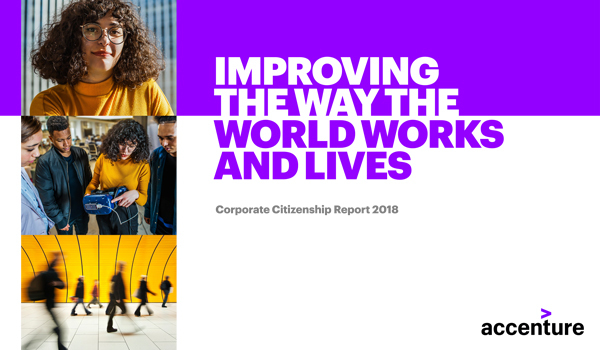 Corporate citizenship has always been fundamental to the way Accenture operates. Guided by the responsibility to their people, clients, communities and the environment, the company leverages its understanding of technology and its impact to help create more-inclusive societies that offer more opportunities to more people. Accenture’s commitment is brought to life by its 477,000 people—a diverse collective of innovators who shape ideas into far-reaching solutions to complex societal challenges. Together, they are working to improve the lives of millions, now and for the next generation. Investing in skilling for the future. In May 2018, the company committed to invest more than US$200 million in education, training and skills initiatives over three years to equip people around the world for work in the digital age. With its strategic partners, Accenture has since 2010 equipped more than 2.8 million people globally with job skills through its Skills to Succeed initiative—and is well-positioned to meet its goal of equipping more than 3 million people by the end of 2020. Breaking down barriers to employment. Together with its partners, Accenture is building a next-generation digital workforce and bringing young people into a more-inclusive future of work. For example, with Save the Children, the company developed Better Careers Through Extended Reality (BecaXR)—an immersive augmented and virtual reality tool that helps young people envision new careers, using 360-degree video to immerse themselves in typical workplaces and understand requirements of jobs in their local market. Addressing urgent social issues: Accenture is leveraging new technologies such as AI, blockchain and extended reality to address complex societal challenges in areas including health, human rights, inclusion and environmental sustainability. For example, the company’s virtual Homecare platform, piloted in the United Kingdom, uses AI to help older people live independently. Focusing on equality in the workplace. By the end of 2018, Accenture grew its workforce to more than 42 percent women—up from 41 percent the prior year—towards its goal of a gender-balanced workforce by 2025. The company also publishes its workforce demographics annually—including gender—across key geographies. Accenture achieved the number one position on Barron’s 20 Most Sustainable International Companies list; was included on CDP’s Climate Change "A List”; named one of Fast Company’s World’s Most Innovative Companies and ranked No. 1 on the 2018 Thomson Reuters Diversity & Inclusion Index. To explore more, visit: accenture.com/corporatecitizenship.